The former chief of Japanese carmaker Mitsubishi Motors has denied criminal charges that he conspired to cover up defects which led to a fatal accident. Former president Katsuhiko Kawasoe and ex-vice president Takashi Usami are on trial in Yokohama, near Tokyo. 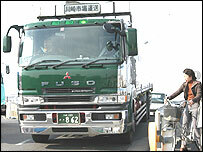 Mitsubishi has admitted that it covered up the clutch problem which led to the death of a truck driver in 2002. The faults have forced the Japanese firm to make a numerous recalls to fix the problems. Mitsubishi is the only major Japanese carmaker to be making a loss, and domestic sales are down 45% in August from the year before. The company's other problems include the refusal earlier this year of backer DaimlerChrysler to inject new funds to help it recover from the market drubbing it is receiving. Mitsubishi's truck arm Fuso was spun off in 2003, and Mr Kawasoe stepped down in 2000 as part of the company's admission that it had for years covered up a string of defects. The clutch problems date back to 1996, prosecutors say. According to the charges, Mitsubishi executives found out about the clutch defects in May of that year - and realised they could cause a major accident. But it is alleged that instead of mounting a recall which could cost as much as 9bn yen ($81m; £45m), they decided to institute a covert repair programme. Two less senior executives have already admitted to knowing about the clutch problem. But they denied the charge of professional negligence, which carries a maximum penalty of five years in jail or a 500,000 yen fine. Mr Kawasoe and Mr Usami, meanwhile, say they knew nothing about it. "I am not in a position to assume criminal responsibility, because I was in charge of overseas affairs," Mr Usami said. At the time of the alleged cover-up, he headed Mitsubishi's trucking division. The two men, along with other executives, have already pleaded not guilty in a second case concerning the death of a 29-year-old woman when a tyre flew off a moving truck in the southern city of Fukuoka in January 2002.